Facts: Client was pulled over for traveling 93 mph in a 70 mph zone. Officer wrote client a citation for speeding. Result: Case REDUCED to regular speeding upon Motion filed by Kreps Law Firm Traffic Attorney and payment of court cost. Facts: Client was pulled over for traveling 92 mph in a 70 mph zone. Client was traveling in his personal vehicle at the time, but client has a commercial driver’s license. Officer gave client a citation for speeding. 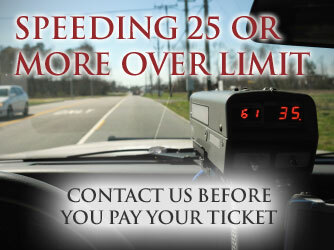 Facts: Client passed an officer and was ticketed going 80 mph in a 70 mph zone. Result: Charge REDUCED to Regular Speeding 74 mph in a 70 mph zone and payment of fine and court costs of $193.00 per negotiations by Kreps Law Firm Traffic Defense Attorney and prosecutor. Client did not appear in court. Facts: Client was ticketed for speeding 99 mph in a 70 mph zone. Result: Charge REDUCED to Regular Speeding 84 mph in a 70 mph zone and payment of fine and court costs of $277.00 per negotiations by Kreps Law Firm Traffic Defense Attorney and prosecutor. Facts: Client was ticketed going 58 mph in a 40 mph zone. Result: Alabama Speeding ticket DISMISSED upon completion of driving school and payment of court costs of $113.00 as negotiated by Kreps Law Firm Traffic Defense Attorney. Facts: Client was cited for driving 104 mph in a 70 mph zone and ticketed for reckless driving. Result: Reckless driving REDUCED to regular speeding upon payment of $200.00 fine plus $158.50 in court costs as negotiated by Kreps Law Firm Traffic Defense Attorney.